A 25-year-old woman has a one in 1200 chance to give birth to a child with Down syndrome. Is one ever expecting it? Of course not. Two healthy, “normal” people do not expect to be given the news that their newborn daughter has “features” that lead the doctors to believe she has Down syndrome. It is hard news for any parent to process. It took me some time to process everything that happened over those few days following Loretta’s birth. I had a night where I shed plenty of tears because I knew that there would be challenges ahead for Loretta and for us as her parents. She was special to us, but not because of her diagnosis. She was special because God blessed us with a child. No one needs to feel sorry for us. How many of my friends have longed to see their child alive, but must await the day of the resurrection because their child or children have died in the womb? Here we are blessed with a beautiful daughter who by every standard is physically healthy, but who has an extra chromosome. God placed her into a family that would love her unconditionally. He placed her in a family that would not seek to terminate her. Some places in the world view Down syndrome as something to eradicate. A quick web search will turn up results from Iceland that state close to 100% of women in Iceland terminate their pregnancy if in prenatal screening there is a positive test for Down syndrome. There is a culture of death that spreads across the world, not merely in Europe and the United States. The next morning after Loretta’s birth, our pediatrician came in to speak with us about Loretta and her diagnosis. This happened about 6 A.M. for a little context. Having never met the man, I knew very little about what to expect, but I would have hoped he would be ready to tell us things were going to work out and be ok. Those were the kind of words we needed. Instead, he wanted to know why we had not asked for genetic testing during the pregnancy. I responded with an answer to inform him about our culture of death. Our family did not want pressure to have an abortion nor did we believe those results are ever 100% accurate. He assured me that the medical field is not people trying to pressure abortions. He said, “There are just too many people in the medical field who want to be heroes, just like there are parents who want to be heroes. Genetic testing helps the parents make more informed decisions.” What sort of informed decision would we need to make? That was the last he ever came into our room or saw our daughter. We promptly sought another doctor. We are informed by God’s Word that He is the one who knits us together in our mother’s womb. We are informed by Scripture that life is given by God and redeemed in Christ blood. We are informed that the little children are precious to Jesus. 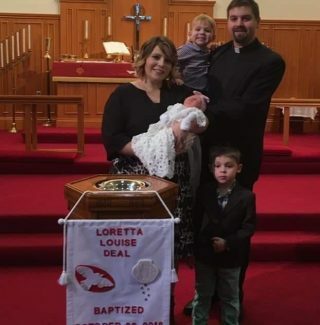 The Lord placed Loretta in our family so that she would be made His child by Holy Baptism. Even though she would be one in 1200 to the world, we know she is one in the Lord by her baptism. 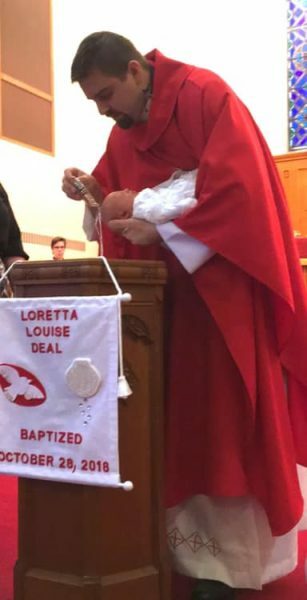 On October 28, 2018, Loretta was baptized in the Name of the Father, and of the Son, and of the Holy Spirit. God cast from her the evil spirits and gave to her the Holy Spirit. He gave to her in baptism the forgiveness of sins and an inheritance of eternal life. It was not because of her merit or any worthiness in her, but solely by the grace of God. The Father looked down upon her in love and, for the sake of His Son, Jesus Christ, our Lord, cleansed her from all her impurities. I cannot begin to describe to you how important the doctrine of salvation by grace alone is to us, and to families who know there is a high likelihood that their child will struggle to learn in life. Faith is not based on one’s mental faculties; it is not measured by the amount of Scripture one knows; it is a gift of God in Christ Jesus. This doctrine is Ana’s and my comfort when people explain to us some of the things we should be prepared for while raising Loretta. 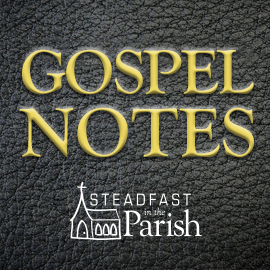 Thanks be to God for faithful hymn writers who have expressed this doctrine with music. Hymns have become such an important part of my life since the seminary. I really had not understood or recognized their worth until then. Over the last few weeks, one special hymn has been on my mind. That hymn is By Grace I’m Saved, Grace Free and Boundless. Eventually, I opened my hymnal to share it with Ana, and I sang it aloud. I went back to stanzas 1 and 5 to read it to her. I want the best for Loretta, but the best was not for her to have died in the womb by abortion. The best is for her to be united to the Father through Christ. God makes that gift of grace available for free in Baptism where He joins plain water with His Word. No matter whatever Loretta may struggle to do here on earth, God has assured Ana and me that she will not struggle to enter into the gates of heaven because she is saved by grace, grace free and boundless. God’s grace does not discriminate against age or mental faculties. “…He saved us, not because of works done by us in righteousness, but according to his own mercy, by the washing of regeneration and renewal of the Holy Spirit, whom he poured out on us richly through Jesus Christ our Savior, so that being justified by his grace we might become heirs according to the hope of eternal life. The saying is trustworthy…” (Titus 3:5-8). God’s Word calms both our hearts and minds because we have trembled and feared with many unknowns over the last few weeks with all the tests Loretta has needed for her heart, lungs, ears, and body. We have found help and strength secure in the Gospel of salvation. God has richly blessed Ana and me with a beautiful daughter and He has taught our hearts not to fear because we have been given the assurance of “the one hope that belongs to your call— one Lord, one faith, one baptism, one God and Father of all, who is over all and through all and in all” (Ephesians 4:5-6). Thank you for your Christian witness. This doctrine, as you so eloquently write, should be supreme comfort for all of us! We should all bask in the radiance of our Holy God who works in us through divine monergism, knowing none of our shortcomings interfere with His work. Thank you for this wonderful post upholding the sanctity and beauty of life, and may God bless your family! You are indeed blessed and will have a lot of love shared between you and your daughter. Please check out http://www.noahsdad.com – When Noah was born, Rick and Abby Smith had an experience much like yours. Noah is 7 years old now and full of love for everyone he meets. Rick has chronicled Noah’s story at this site and there are also resources there yoou may not be aware of. May God continue to richly bless you and your new family. God bless Loretta and the entire Deal family. Thank you for this wonderful article. It is good that we be ever reminded that the grace of God is for all people and that our salvation is not found in our own strength of mind or body – nor reason or works – but, by faith in Christ alone who has redeemed us by His blood and through a blessed washing of water and Word at the font. My wife had turned my attention to Noah’s story only a few days ago. I do give God thanks for the increase in understanding and resources available for parents who are wondering “what should we do?” There are so many great websites and groups on FB to receive support and advice. Thank you for allowing us to share your story. Thank you for the love you have for your wife and your daughter. Thank you for your powerful witness to the Gospel and its power to change lives. Blessed are you, O Lord, Giver of all good gifts, Who will make all thing new. This is a beautiful article – heartfelt, honest and truly Christian. Thank you so much for sharing your story. You have helped me gain a better understanding of the precious gift we receive through baptism. Thank you, and may God bless you and your family. Thank you for this beautiful confession of God’s grace in Christ for you and your daughter. What a gift that precious little girl is! My Down syndrome child was born to me when I was 19. I have seen God in my life through him many times. He continues to be a blessing to us as he approaches his 53rd birthday. God chose your family for this journey. You will be mightily blessed and bless many others in your walk with Loretta. Thank you all for the kind words and encouragement. My wife and I are truly grateful for Loretta and excited about what lies ahead, but we also have our moments of anxiety. 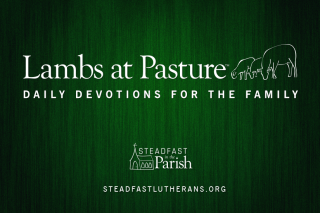 Thank you for sharing this with your family, friends, and congregations. We hope it brings encouragement to others and strengthens your faith in the word of God. God is good all the time! Collectively synergize missional in-person gatherings.